This was the third time I saw Alan Parsons' band play live (not counting the Liberty Concert). The first time was Rotterdam '94 and the second time Utrecht '95. Before the show I was arguing with my brother what the probable concert opener would be. I was convinced that they would use 'Sirius/Eye in the Sky' like they did during the previous concerts. My brother was convinced that it would be an intro tape leading into 'Blue Blue Sky', a track from the new album. We were both suprised when the band just walked on stage at 8.20 hours and started playing 'Doctor Tarr and Professor Fether'. Both during this track and the next one ('Can't Take it With You') the sounds was a bit loud and slightly distorted. Fortunately, this mixing problem was solved within a couple of minutes. During the show vocals were switched between Peter Beckett (high vocals) and Neil Lockwood (heavy vocals). Lockwood can also be heard singing some of the tracks on the new 'On Air' album. Peter and Neil would also do a few duets at the end of the show ('Don't Asnwer Me' and 'Games People Play'). Unfortunately, John Giblin (bass) did not perform a bass solo during 'I Wouldn't Want to be Like You' like Felix Krish had done in Utrecht during the previous tour. When 'Old and Wise' was played I was afraid that it would be another version without the sax solo because this time Richard Cottle was not in the band. To my great suprise guitarist Ian Bairnson picked up a sax and played the solo on this song, as well as on 'Don't Answer Me' later in the show. He did quite well. After a medley of 'Money Talks' and the end section of 'La Sagrada Familia' stars were projected on the white sheet behind the band while they started playing 'Days are Numbers'. Both this song and 'Doctor Tarr ...' had been added to the setlist after Alan had noticed the high positions they got in a readers poll. The version of 'Days are Numbers' was great and included extended keyboard and guitar solos. Talking about the keyboards, ex-It Bites member John Beck was really enjoying himself. If someone would have painted him black and gave him some sunglasses he would have looked exactly like Stevie Wonder. The other guys in the band were having a great time as well. 'Prime Time' featured another long guitar solo while Ian walked around the stage. The expressions on his face showed that he was really 'feeling' his solo. Peter sang 'Time' which was slightly spoiled by some out of tune strings on Neil's guitar. Fortunately, Neil's performance of 'Limelight' in a solo spotlight made up for this. Then followed the only song from the 'Try Anything Once' album; 'Turn it Up'. I have never heard versions of this track which sound as good as the one on the album. In spite of the new keyboard solo John played, this version must have been the most disappointing one I've ever seen played live. A rocking version of 'Standing on Higher Ground' closed this 'golden oldies' first set. The switch of slides projected on the white screen was far from perfect but nevertheless added a bit to the strength of the song. I was slightly disappointed that they hadn't played any new songs from 'On Air' yet. However, the rest of the audience was having a marvellous time with the old material I had already seen two times before. A selection from the new album followed; 'I Can't Look Down', 'So Far Away' (with Giblin on double-bass), 'Fall Free', the instrumental 'Cloudbreak' and the beautiful 'Brother Up In Heaven'. This made my initial disappointment about the first set vanish with the wind. Something went wrong during the keyboard introduction of 'Cloudbreak', which made it sound very strange. Fortunately the arrival of Ian's solo solved this problem. During the track cut-out slides of planes were projected on moving clouds on the white sheet. Nice but not stunning. Before playing 'Brother Up in Heaven' Ian told the audience that the song was about his cousin Erik Mounsey who was a helicopter pilot on a peace mission during the Gulf War. Erik was shot down by mistake by an American jet. A spine tingling version of the song was followed by a roaring applaus from the sympathizing audience. Clearly a highlight of the evening. Unfortunately Alan found it necessary to promote the new album after each 'On Air' track, which made the audience a bit laconic after a couple of songs. After this great 'On Air' part of the show followed one of my favorite live songs; 'Psychobabble', complete with the long spooky intermezzo. People started dancing in the aisles and were having a great time. When the band left, the crowd roared for more. After a first encore of 'Don't Answer Me' and 'Gonna Get Your Fingers Burned' they hadn't seen enough yet. The band came back one more time to play a fabulous version of 'Games People Play'. By this time the whole audience was clapping along, dancing or at least slightly moving their limbs. A standing ovation ended a very entertaining performance by a great band. Although I would have liked some more tracks from the last two (refreshing) albums it was (once again) a very special night. Me and my wife went to the After Show for a short while. Unfortunately a lot of people were backstage, including a large deligation of the English fan club and some people from the record label. When the band hadn't arrived after half an hour I was about to leave (some friends were waiting outside) and was already standing near the exit when Alan walked out of the dressing room with a large cup of Cola (?). I shook his hand, introduced myself and asked if it would be possible to take a picture with the band for the Internet page. Only part of the whole band was present at that time but they gladly posed while my wife took a photo. I promised to send Alan a copy of this review, complimented the band with a great performance and we quicky went to our friends who were outside. For more information about Alan Parsons or the Alan Parsons newsletter 'The Avenue', e-mail Steve Martin or check out the Avenue Web Page. 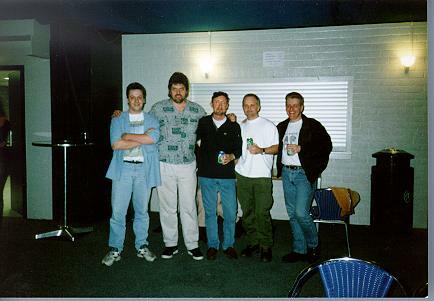 From left to right: Ed Sander, Alan Parsons, Ian Bairnson, Stuart Elliot, Peter Beckett.